Experience a life-changing event premised on the belief that familiarity with another culture enhances understanding for global peace.Our aim is to make you feel at home away from home,while we familiarize you with the lifestyle,culture and traditions of our Maasai community. 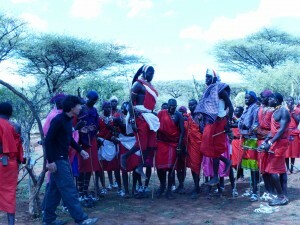 A line of Maasai warriors gathers in the distance, away from the crowd, their warrior shouts punctuating the still air. Grunts follow chants and the pounding of feet, harmony, and heartbeats. They move forward not as 12 men, but as one. One flow, one rhythm, one movement forward. There are no drums, only voices as instruments and rhythm. As the men get closer, the volume of their chants rise, the intensity of their movement increases, converging into steady rhythm. Up, bend, forward. Up, bend, forward. A human pulse, a human beat that reaches into one’s bones even as it traverses the open air. As the men approach the crowd inside the circle of the corral, young women launch into song. Two men, now in the centre of the circle, jump straight up, each time higher than before. As energy flows into and through the corral, the men circle back, offering their own chant in return, a sort of call and response, their voices growing in volume and pitch. This is the essence of the signature Maasai adamu, or jumping dance. Our guests get a rare opportunity to interact with our “morans” and dance with them;with endless photo opportunities for them to keep precious memories of cultural wealth in the depth of Maasailand. 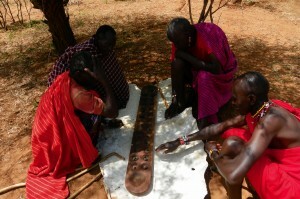 Once one leaves warriorhood and steps in a new world of being an elder with higher calibre of responsibilities,everything changes.However .that does not mean that fun is over!Elders gather mostly in afternoons under special acacia trees to battle out in a special traditional game called “entotoi”. Involves a piece of wood which has holes punched into it ,usually 24 of them.Marbles collected from river banks are used to play. The winner has to arrange all the marbles in a certain order .When our guests visit us,they can participate in the game or just watch the fun of seeing the elders play.The game gets spicy with raised friendly emotions,fired bragging stunts and exchange of “revenge sentiments” .It is all fun!